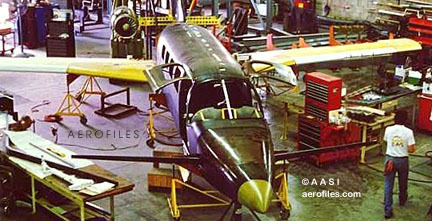 c.1990: AASI Aircraft/Advanced Aerodynamics & Structures Inc (ceo: Roy Norris), Burbank CA. 1998: Long Beach CA. 2002: Acquired Mooney assets as Mooney Aerospace Group Ltd (qv). Jetcruzer 450 19?? (TC A49NM) = No data. Jetcruzer 500 1994 - 6pClwM rg canard; 1570hp P&W PT6A-66A turboprop with 7'0" 5-blade pusher prop; span: 42'2" length: 30'2" load: 1850# v: 345/325/x range: 1277 ceiling: 30,000' (projected figures). Pressurized cabin. The world's only FAA "Spin Resistant" certification. Stratocruzer 1250 200? - Business fanjet. 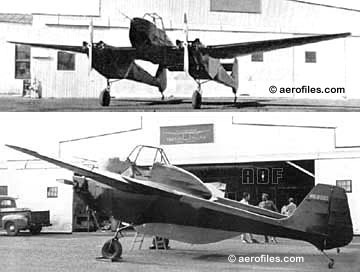 13pClwM rg canard; two 2300# Williams Rolls FJ-44-2 fanjets; v: x/500/x range: 3700 ceiling: 41,000' (projected figures). Pressurized cabin; "world's longest-range aircraft in its class." In development since 1994. John L Abbott, Detroit MI. Midwing 1931 = 1pOmwM; 28hp Lawrance. POP: 1 [820Y]. This is typical of some entries herein where a judgment call was made as to the original make of aircraft. In this case, a scarcity of documentation leads one to believe it might be a plan- or kit-built Church Mid-Wing renamed by its builder. Z-1-X 19?? = No data. 1929: ABC Airline Corp, Lansing MI. 1930: (Talbert) Abrams Aerial Survey Corp. 1936: Abrams Air Craft Corp, 606 E Shiawassee St, Lansing MI. P-1 Explorer 1937 = 2pClwM; 330hp Wright R-975 pusher; span: 36'0" length: 26'6" load: 1410# v: 185/165/66 range: 1400; ff: 11/x/37. Talbert Abrams, Kenneth Ronan; constructed by Ronan & Kunzl of Marshall MI. 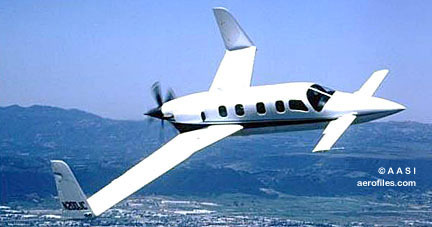 Created as a photo-survey plane with a service ceiling of 21,000'. POP: 1 [X19897]. Repowered with 450hp supercharged Wright in 1938; v: 200/185/66. Historian Vincent J Berinati learned of a Detroit man, George Tabraham (an unusual name), in the '30s who owned airplanes and was involved to some extent in aviation, and wonders if he might have become the also unusually-named Talbert Abrams? Aeronautical Engineering Co, Oakland CA. AE-5 1929 = 2pOhwM; 90hp LeRhône rotary; span: 38'0" length: 29'0". Joaquin S Abreu. Steel-tube fuselage, wood-framed parasol wing. 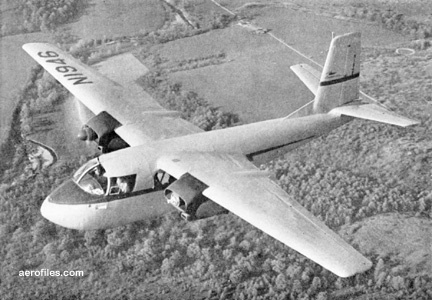 The engine and belly fuel pod was a detachable unit that could be released from the cockpit in case of fire or a dire emergency, and the ship would become a glider. In its first test, this was demonstrated at Alameda CA. From 5,500' the motor and tank unit was jettisoned, falling into sand dunes by the bay, and the ship glided for about 15 minutes before heading for the runway. There a group of people running toward the oncoming ship forced pilot Reed Vowles to swerve the plane and nose it into soft ground, sustaining minor damage. POP: 1 . 1919: Aircraft Engineering Corp, 535 E 79 St, New York NY. c.1920: Rights acquired by Horace Keane, (sales office) 280 Madison Ave, NYC, (plant) North Beach, Long Island NY. 1931: It is unclear how this line relocated on the West Coast some 10 years after Keane's ownership, but two Ace models are shown in DoC registers as produced by Aircraft Engineering at 5400 Telegraph Ave, Oakland CA. K-1 Biplane 1919 = 1pOB; 40hp Ace; span: 28'4" length: 18'0" (?>16'1") load: 225# v: 63/55/30 range: 160. Alexander Klemin (Professor of Aeronautical Engineering, NYU), N W Dalton. Prototype had Ford T motor. One of the first planes to be built on an assembly line, primitive as it was. Four "self-aligning" I-struts, all-wood frame. Manufactured at the ACE Flying Field in New York City's Central Park. $2,500; POP: 8, one of which made quite a splash in the national press when it landed on Clay St in Oakland CA as a publicity stunt, 1/22/20 (p: C V Pickup). The 1920 version was modified with beefed-up struts, redesigned fuselage with enclosed motor, folding wings; span: 25'0" load: 235 v: 80/x/32; $3,000. Also produced in 1931 with Salmson AD-9 [952Y] c/n 1, and LeBlond 5D [953Y] c/n 2, registered as Ace 300 and 200 respectively. One located and restored in California 1955 [N69097]. SEE ALSO Keane Ace. (Albert C & Fred G) Essig Aero Advertising Service, Los Angeles CA. 1928 = 2pOlwM; 125hp Siemens SH-14; span: 34'0" length: 26'0" load: 500# v: 125/110/35. Full-cantilever wing. POP: 1. 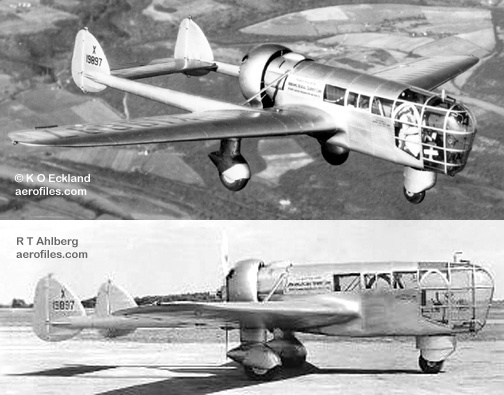 Aviation described this as "a typically German low-wing monoplane with a plywood wing, and a welded steel fuselage," which suggests a design in the Aeromarine class. 1965: Ace Aircraft Mfg Co (fdr: Thurman G Baird), Asheville NC. Acquired assets and rights to (ex-Corben) Baby Ace, as well as to American Flea and Heath Parasol. Model D Baby Ace 1965 = 1pOhwM; 65-85hp various; span: 26'5" length: 17'9" load: 375# v: 110/100/34 range: 350 ceiling: 16,000' (data for 65hp). Much-modified evolution of the original Corben design. Marketed plans and kits for home-builders. ALSO SEE Corben Ace, EAA Baby Ace. Model E Junior Ace 1965 = 2p version of Model D with 85hp Continental C-85 and side-by-side cockpit; span: 26'0" length: 18'0" load: 526# v: 130/105/65 range: 350 ceiling: 10,000'. Acme Aircraft Corp, Loves Park (Rockford) IL. Biplane 1928 = 2pOB; 85hp Wright-Gypsy. POP: 1 [C44N] (also appears in some registers as Sportsman). Sportsman (Model 21) 1928 = 2pOhwM; 55hp Velie M-5; span: 36'0" length: 22'11"; ff: 10/2/29. Edward Stalker (University of Michigan). Folding wings. POP: 2 with Velie [X152E, 13622], the last of which later had 100hp Kinner K-5 and was rechristened by its owner as Smith O, and 1 with 45hp Szekely . [X152E] is also noted in registers as Para-monoplane, for what that's worth. Acme Aircraft Co (Hugh Crawford, C Roger Keeney), Torrance CA. (Certain rights and equipment either to or from Longren Aircraft Co, Torrance; data are sketchy).) 1953: Sierradyne Inc, 6335 Riggs Pl, Los Angeles CA. Centaur 101, 102 c.1953 = 6p conversion of surplus Stinson/Convair L-13A for bush flying, based on a prototype by Longren Aircraft Co, Torrance CA [N4901V]. Centaur 101 had 300hp Lycoming R-680-E3, Centaur 102 with 300hp Jacobs R-755-A2. POP: unknown, reportedly only a few. F8F-2 195? (TC AR-32) = Civil conversion of Grumman F8F-2, possibly for racing. Sierra S-1 Sportplane 1948 = 1pCmwM; 85hp Continental C-85 pusher; span: 20'2" length: 18'0" v: 200. Empty wt: 590#. Ron Beattie, Walt Fellers; built by Acme's Crawford and Keeney. Tail-mounted propeller. POP: 1 midget racer Sierra Sue built and flown, but never competed [N12K]; aka Beattie-Fellers S-1 (Ronald Beattie & Walter Fellers) in 1960. Used by Sierradyne in the '60s to test and promote Northrop's and Dr Werner Pfenninger's boundary layer control concepts, although it was never officially a Northrop plane. Reported by John D Lyon as presently displayed at Los Angeles Science Museum. 1954: Air Craft Marine Engineering Co, Van Nuys CA. Anser Amphib - 4pCmwMAm twin-jet prototype fighter was reported under construction in 1958, but never completed. Assigned RS-695B project number by the Army Air Forces Air Materiel Command. "Anser" was acronymic for "Analytical Service Inc," involved in the project to an unknown degree. Acro Sport Inc, Hales Corners WI. Sport 19?? = 1pOB; 100-200hp various; span: 19'7" length: 17'6" v: x/130/50. Aerobatic capability. Marketed plans and kits. Sport II 1978 = 2pOB; span: 21' 8" length: 20'9" load: 645# v: 123/x/53; ff: 7/9/78. Also marketed plans for Super Acro Sport, Pober Pixie. 1928: Grays Harbor Airways (pres: Carl Morek), Aberdeen WA; production rights bought from Santa Ana Aircraft Co, Eddie Martin Airport (now John Wayne Airport), Santa Ana CA. 1928 = 3pChwM; 80hp Anzani; span: 38'3" length: 25'0" load: 750# v: 90/x/45 range: 500. Purchase and rename of J O York's Santa Ana monoplane as prototype, with possible modifactions for commercial use. Later with 100hp Kinner. No record of further production. c.$2,500; POP: 1 . Probable reg error, should be . Adam Aircraft Industries (fdr/pres: Rick Adam), Denver CO.
A500 CarbonAero 2002 = 6pClwM rg; 700hp Continental; ff: 7/11/02 (p: Glenn Maben). A700 2003 = ff: 7/27/03. No data. M-309 2000 = 6pClwM rg; two 300hp Continental TSIO-550-G in pusher-puller tandem; span: 42'0" length: 34'6" load: 2300# v: 288/253/x ceiling: 25,000'; ff: 3/21/2000. Burt Rutan. Pressurized cabin; twin-booms. Composite construction by Scaled Composites in Mojave CA. POP: 1 prototype [N309A]. J Adams, Staten Island NY. B-4 1930 = 1pOhwM; Henderson motorcycle engine. No data, possibly a modified Pietenpol [742Y]. (?) Adams-(Phil) Toman Aircaft Co, Aberdeen WA. ATA Cruiser 1928 = 3pChwM; 110hp Warner Scarab; span: 38'3" length: 25'0" load: 800#. Empty wt: 1200#. Semi-cantilever wing. POP: 1 [NX14M] s/n 100. Registration noted: "May be entered in National Air Races." Fate unknown; registration reassigned to Lockheed in 1952. This might be a Warner-powered copy of Activian. 1929: Adcox Aviation Trades School (Aircraft Builders Corp), Portland OR. 1929: Reorganized as First National Flying System. 1-A 1929 = 2pOB; Hisso. [X246K] c/n 1001. Cloud Buster 1931 = 2pCM; 40hp Salmson AD-9. POP: 1 student project [NC10644]. Repowered in 1936 with 65hp LeBlond. This appears in some regs as a product of Bidwell-Yale Aviation Co; SEE Bidwell. Special 1929 = 2pOB; 100hp Kinner K-5. POP: 1 student project . Design evolved into aptly-named Student Prince. Student Prince (Aircraft Builders) 1929 (ATC 2-258) = 2pOB; 85hp Cirrus Mk III; span: 30'3" length: 23'6" load: 585# v: 110/85/37 range: 500; ff: 9/17/29 (p: B B Smith). Basil B Smith. POP: 6, of which only 3 were certificated [NC263V, X828M, NC893K], the other 3 being restricted to flights within Oregon. The last one ended up certificated after WW2 as an amateur-built aircraft. Cirrus, with inherent dependability problems, was soon replaced by 100hp Kinner K-5, then 110hp Warner, 150hp Comet, and 150hp Hisso A (one even gained a 220hp Continental in 1963). Student Prince X (Aircraft Builders) 1931 = 90hp ACE. POP: 1 [NC10686]. 1916: Walter J Addems, Loda IL. 1920: Judd IA. c.1955: Atherton CA. First airplane, a glider, was built in 1916 from plans in Aviation Week and flown successfully enough to qualify the teenager for membership in the Early Birds organization. On retirement from a career flying for Natl Air Transport and UAL, Addems became well regarded for his faithful reproductions of classic aircraft. Aircraft Design Inc (pres: Martin Hollman), Monterey CA. Stallion 1994 = 4pChwM rg; 280hp Continental IO-550-G; span: 35'6" length: 25'0" load: 1400# v: 241/224/69 range: 1500. [N408S]. c.1973 = 1pChwM; 75hp Continental C-75; span: 19'6". Empty wt: 554#. [N1857]. Based on Tailwind and Cougar designs. Midwing 1957 = 1pCmwM; 65hp Continental; span: 18'3" v: x/110/x range: 250. POP: 1 [N2148C]. Earl and Jerry Adkisson, John Canfield, Lincoln NB. SJ-1 Head Skinner 1958 = 1pOhwM; 65hp Continental (replaced with 125hp Lycoming O-290-G4 Canfield c.1963); span: 24'6" length: 20'0" load: 300# v: 180/150/60 range: 300. Gull-wing. 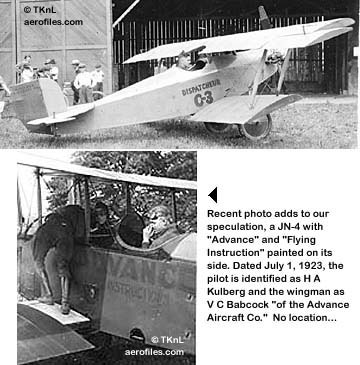 1923: Advance Aircraft Co (V C Babcock, H A Kulberg), location unknown. c.1923 = 1pOB. Logic says this is Vearne Clifton Babcock (SEE Babcock and Taubman), but there was no info found on this creation. Note odd rudder and overhanging ailerons! Minuscule lettering at top of rudder says: "Advance Aircraft Co," and on fuselage is: "DISPATCHEUR" and "C-3." The only Advance Co we know of was an early Waco name, but this is certainly not one of theirs. 1983: Advanced Aircraft Corp, Carlsbad CA. 198x: Riley International Corp.
1983 = Cessna conversions to PT6A turboprops. Advanced Aviation Inc, Orlando FL. No data found on this operationpossibly sailplanes or untralights. 1967: Aerial Distributors Inc, Wichita KS. Distributor Wing DWI-1 1965 = Unusual twin-engine 1pClwM agricultural aircraft with a powered, internally-mounted spray system; two stacked Lycomingsa 350hp IGO-540 for flight and a 108hp O-235 (?>O-320) driving an axial-flow fan; span: 43'10" length: 28'4" v: x/70-150/74; ff: 1/30/65. The plane climbed at 350fpm at gross weight of 5,200# with just the O-540; the O-235 powered the spray system and provided thrust augmentation. Guide vanes in the wings increased flap effectiveness. Cutaway art shows air flow path into an hydraulically-run metering gate feeding material from the hopper, through wing ducts and out variable wing slots. Hopper was a drop-in unit, fuel was in leading-edge tanks. Aerial Equipment Co (fdrs: Ben Catchins, Yves de Villiers, F H Johnson), New York NY. 1910 = No data. Perhaps the company was only a supply house. 1907-09: A design consortium comprised of Frederick Walker "Casey" Baldwin, Glenn Hammond Curtiss, John Alexander Douglas McCurdy, and Lt Thomas Etholen Selfridge formed by Alexander Graham Bell at his Canadian home; an early "think tank," advancing the experiments of Australian Lawrence Hargrave during the 1890s. Aircraft were built at Hammondsport NY. AEA financing came from Bell's wife, Mabel Gardiner Hubbard Bell, in the amount of $30,000. Aerodrome #1, Red Wing 1908 = 1pOBF(skids); 40hp* Curtiss B8 air-cooled V-8 pusher; span: 43'4" length: 26'3" load: 185#. Thomas Selfridge. Named for its red fabric coloring, covered thusly for the sake of photographic documentation. First public flight of an airplane in the US. Having no lateral control, it crashed on its first flight at Lake Keuka NY on 3/12/08 after flying a distance of 318'11" (p: Baldwin). *Actual flight efficiency was estimated to be less than 20hp. Aerodrome #2, White Wing 1908 = 1pOB; 40hp Curtiss air-cooled V-8 pusher; span: 42'3" length: 26'3" load: 175#; ff: 5/18/08 (p: Baldwin). F W Baldwin. Tricycle gear; first use of ailerons (which led to long-term litigation over the Wright Brothers' claim of violation of their patent for movable wing surfaces). Lateral control of movable, triangular ailerons was by way of a body yoke attached to the pilot, who leaned in the direction of a turn. Flew a distance of 1,017' on 5/21/08 (p: Glenn Curtiss). Damaged beyond repair on landing two days later and abandoned. Aerodrome #3, June Bug 1908 = 1pOB; 40-50hp Curtiss air-cooled V-8 pusher; span: 42'6" length: 27'6" load: 142# v: 39; ff: 5/21/08 (p: Curtiss) for a distance of 152 yds. Glenn Curtiss. Employed pilot-induced movable wing-tips as ailerons, as on White Wing. 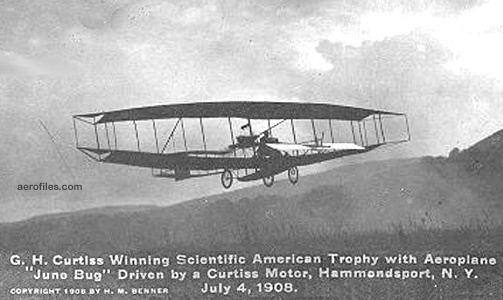 Made a total of 32 flights, one of which as the first plane to fly one kilometer, on 7/4/08, at a recorded 39mph, for which Curtiss was awarded the Scientific American trophy, then crashed on 1/2/09 and went into retirement. 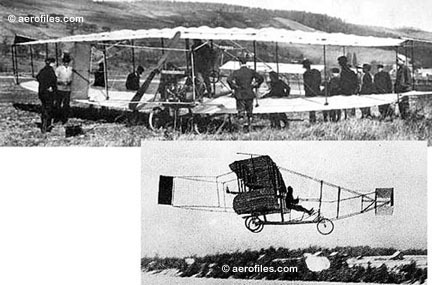 Design evolved into 1909 Curtiss Golden Flyer. Coincidentally, aviation's "dope" also originated here when plain varnish used to water-proof fabric coverings soon cracked with use and a more flexible replacement was created by AEA from a test mixture of paraffin, turpentine, and gasoline. Over the years that basic formula was much modified and improved, but June Bug had the first coat of actual dope. How they came to choose that word, which stems from the Dutch term "doop," for a sauce or mixture, is not known. Aerodrome #3-A, Loon 1908 = June Bug as a twin-pontoon floatplane, attained a surface speed of 27mph, but failed to break loose from the water. During subsequent attempts it went out of control, sank in the shallows, and became frozen in the ice. Further experiments in water take-off were left to Curtiss' 1911 Hydroaeroplane. Aerodrome #4, Silver Dart 1908 = 1pOB; 50hp Curtiss water-cooled V-8 pusher; span: 49'1" length: 30'0" (?>32'0") load: 290#* v (est): 40 range: 20; ff: 6/21/08 (p: McCurdy). John McCurdy. *Calculated useful load showed figures of 150# for pilot, 110# of gas and oil (including tank), and 30# of water. Made from steel tube, bamboo, friction tape, wire and wood, it was covered with silvery rubberized silk balloon-cloth, its propeller was carved from a solid block of wood, and it had no brakes. 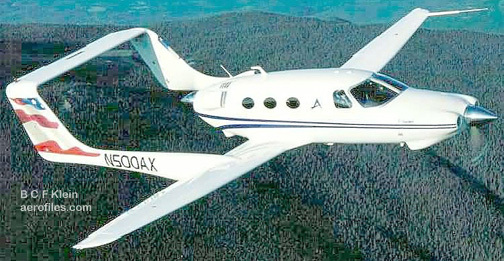 The last of AEA's team efforts, it went to Canada and also became the first airplane to fly in that country (2/23/09). Although Canadian Army officials were for the most part unimpressed, doubtful that airplanes would ever amount to much in warfare, AEA was finally invited to the base at Petawawa to demonstrate their machine. Sandy terrain there was a problem for the aircraft's small wheelsMcCurdy faced great difficulty taking off. Then, landing after its fifth flight, the ship crashed when one wheel struck a rise in the ground. Thus ended the notable, albeit brief, career of the Silver Dart in which McCurdy had flown over an estimated 3,000 ground miles. Aerodrome #5, Cygnet 1909 = Odd "flying wall" on skids with a huge frontal surface composed of 360 tetrahedral cellsa concept carried forward from Bell's 1902 kite designsarranged in a rectangular wingform, and with the pilot perched well out in front on skids; span: 40'0" (?>52'6") length: 13'1". Tested at Baddeck, Nova Scotia, on 2/22 and 24/1909, but failed to fly. Alexander G Bell. Developed from 1907 kite-glider Cygnet I, which was towed by a motorboat to an altitude of 168' (p: T Selfridge), but was destroyed in landing on the water. 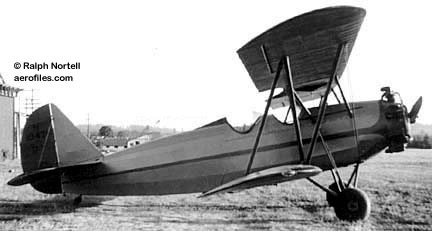 As Cygnet II, it was modified with tricycle gear, 26'4" span, and an 8-cylinder Curtiss motor, with no success. It did finally fly, as Cygnet III, with 70hp Gnôme rotary to help overcome its frontal mass, from ice-covered Lake Bras d'Or, Nova Scotia, on 3/1/12, attaining 43mph (p: J McCurdy). Aerial Transit Co, Singer Bldg, Manhattan NY. 1908 = Little was found about this intriguing project, quite apparently unbuilt. July 1909 Fly reported formation and funding of the company to develop "the Pennington devices ... a combination of dirigible and aeroplane" that would result in a machine 1,250' long capable of traveling 9,000 miles in a single voyage, and that contracts were signed for "several aeroplanes at $5,000 each." First stock issue was claimed to have gone to none less than Standard Oil Co, and construction would be at the (Lewis) Nixon shipyards on Staten Island, one of the principals. Aerial Transport Corp, New York NY. V.B.L.-1 1921 = OB tractor described as an "express transport of three-ply construction." 1922 Eaton Chronicles reported that Rogers Construction Co (SEE CD Air Express) "... takes over the building of a Sport Biplane designed by C H Day of the defunct Aerial Transportation [sic] Corp." Then in 1925, "Charles 'Pop' Dickinson buys the C D Air Express from Rogers," which is described as a C H Day design. This would be conclusive proof that VBL-1 and CD Express are one and the same. Model 3 c.1963 = 2phwOM; 85hp Continental pusher; span: 30'0" length: 19'0"; v: 105/85/48. Roadable airplane with a pusher engine and four-blade prop. 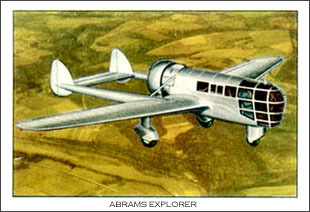 Wing with wood spar and aluminum ribs; fabric-covered steel tube fuselage; quad gear with steerable front wheels. The wings could be folded by one man in five minutes for driving as a car up to 50mph. [N9085C]. Dec 1944: Aero Engr Co. 1950: Aero Design & Engr Corp (Ted Smith et al), Culver City CA. 1950: Aero Commander Inc, Bethany OK. c.1958: Aero Design & Engr Co. 1963: Ted Smith left company to found Aerostar Co. 1965: Aero Commander Div of Rockwell Standard Corp; acquired rights to Snow S-2. 1965: Acquired rights and tooling to Meyers 200; Albany GA. 1967: Ended operations when Rockwell Standard merged with North American Corp as North American Rockwell/Rockwell Commander Inc. 197? : General Aviation Div, North American Rockwell. SEE ALSO Butler Mfg Co; Ted Smith & Associates (Aerostar Corp), Santa Maria CA; Aero Design & Engr, Bethany OK; Aerostar Aircraft Corp, Couer d'Alene ID. 100, Cadet, Darter 1965 = Continuance of Volaire 1050. 4pChwM; 150hp ? ; load: 970 v: 142/128/48 rang: 510 ceiling: 13,000. $8,950 in 1969. Name changed to Darter in 1968. 200D 1966 = New production of Meyers 200D. 4pClwM rg; 285hp ? ; load: 1060# v: 235/215/54 range: 1,060 ceiling: 18,500'. 200E 1967 = Swept-tail 6p version of 200D. POP: 1. 500 (6A1) 1958 = 6pChwM rg; 230hp Lycoming O-540-A1A6, later -A2B. Gross wt: 6000#. 500-A (6A1) 1960 = Continental IO-470-M; redesigned nacelles, structural mods, new landing gear, gross wt: 6250#. 500-B (6A1) 1960 = Lycoming IO-540-B1A5; gross wt: 6750#. 500-S (6A1) 1968 = Interior changes, pilot's door. 500-U, Shrike Commander, Shrike Esquire (6A1) 1964 = 4-8pChwM rg; two 230hp Lycoming O-540-A1A6, later GO-480-C1B6; span: 49'1" length: 36'7" load: 2230# v: 215/203/78 range: 750 ceiling: 19,400'. $103,950. The only twin in its class approved for limited aerobatics, as demonstrated by Bob Hoover in tours. Certified in 1958. 520 (Model L3805) (6A1) 1948 = 6pChwM rg; two 190hp Lycoming O-435-A; span: 43'10" length: 32'0" load: 1318# v: 181/165/56 range: 700; ff: 4/23/48. Ted Smith, based on Baumann Brigadier. POP: 1 prototype for subsequent Shrike series [NX/N1946]. Certified in 1950. 520 1951 (6A1) = 5-7pChwM rg; two 260hp Lycoming GO-435-C2B; span: 43'10" length: 34'3" load: 1850# v: 211/197/60 range: 850. In production, subsequent dash numbers represented individual planes. $45,000, $66,000 in 1954; POP: 150 by end of production in 1954, of which 3 to Army and USAF as L-26. Later marketed as Ted Smith Aerostar 600/601, and Rockwell 560/680/685/710 series. 560, 560-A (6A1) 1955 = 5-7pChwM rg; two 295hp Lycoming GO-480-B; span: 49'6" length: 35'0" load: 2200# v: 222/210/66 range: 1625 ceiling: 22,500'. Swept vertical tail, increased gross weight, structural mods. 560-A (6A1) 1955 = GO-480-C1B6; lengthened fuselage, redesigned nacelles, new landing gear. 560-E (6A1) 1957 = GO-480-G1B6; 32" wingtip extensions, gross weight increase. 580-E 1957 = Similar to 560-A with 275hp Lycoming GO-480D. 600 c.1970 (2A7, A3SW) = ChwM rg; two 290hp Lycoming IO-540; span: 34'3" length: 34'10" load: 2075# v: 260/250/77 range: 1400 ceiling: 22,000'. 680-E (2A4) 1958 = 4-6pChwM rg; two 320hp Lycoming GSO-480B-A6; span: 49'6" length: 35'1" v: 255/226/85 range: 1400. Gross wt: 7500#. 680F 1964 = no data. 680FL, Courser Commander 1963 = 5-7pChwM rg; two 320hp Lycoming GSO-540-B1A/-B1C; span: 49'6" length: 35'1"; ff: 12/29/62. POP: sold only in small numbers and cancelled in late 1969. 680T 1964 = Company's first turboprop; two 575hp AiResearch TPE-331 (605hp TPE-331-43 in 1965); ff: 12/31/64. 680T Turbo II, Hawk Commander 1969 (2A4) = 7-9pChwM rg; two 500hp Garret AiResearch TPE-331; span: 44'0" length: 43'0" load: 3935# v: 290/268/94 range: 1490 ceiling: 25,600'. $369,500. 680V 1967 = TPE-331-43BL; picture windows, clamshell gear dors, gross wt: 9400#. 680W1968 = no data. 681B Turbo Commander 1971 = span: 44'1" length: 42'11" v: 390/278/x range: 1315. 685 (Model 680-FL) (2A4) 1962 = 4-6pChwM rg; two 435hp Lycoming GTSIO-520F; span: 49'3" length: 41'6" v: x/225/85 range: 1160. 690 Turbo Commander 1969 = Replacement for Hawk Commander; two 700hp TPE-331-5-251K; ff: 3/3/69. 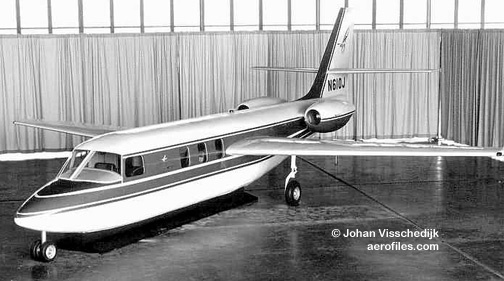 720 Alticruiser (2A4) 1958 = Improved 680-E as the world's first certificated, pressurized, non-airline business plane. 4-6pChwM rg; two 340hp supercharged Lycoming GSO-480B-1A6; span: 47'0" length: 35'5" load: 2600# v: 255/226/71 range: 1550 ceiling: 25,360'. Extended wing, refrigerated air conditioning, Lear autopilot. $183,750. 1121 Jet Commander 19?? = No data. Production rights sold to Israel when Rockwell took over operations. 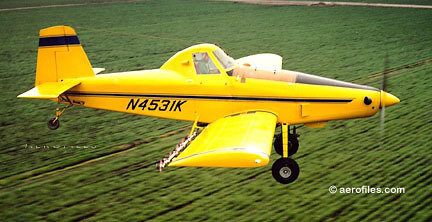 Lark 1968 = 4pChwM; 180hp Lycoming; load: 1000# v: 138/132/60 range: 525 ceiling: 13,000'. L-26 1956 = USAF and Army version of 520, 560, and 680. All redesignated U-9 in 1962. YL-26 1952 = Civil 520. Two 260hp Lycoming GO-435C. POP: 3 to Army [52-6217/6219]; became U-9B. YL-26A 1955 = Civil 560. POP: 1 to USAF [55-3815]; became U-4A. L-26B 19?? = Civil 560-A. Two 270hp supercharged Lycoming GSO-480. POP: 14 to USAF [55-4634/4646, 57-1791]; became U-4B. L-26C 1956 = Civil 680. Two 320hp supercharged Lycoming GSO-480B; span: 44'0" v: 255/198/x range: 1500 ceiling: 22,900'. POP: 2 to USAF as U-4B [55-4647/4648] (SEE below), 4 to Army [56-4023/4026]; became U-9C. NL-26D, RL-26D 1957 = US Army; electronics systems testing as NL-26D and side-looking radar (SLAR) as RL-26D. POP: 1 NL-26D [57-6531] and 2 RL-26D [57-6183/6184], plus 3 modified from L-26C; became NL-9D and RU-9D. Two more were built, but destroyed in pre-delivery accidents. Thrush Commander (Rockwell, Quail) 1968 (A3SW) = 1pClwM agplane; 600hp P&W R-1430-AN1; span: 44'5" length: 24'5" v: 140/124/66 range: 470. Evolution and refinement of Snow S-2. Hopper capacity: 400gal/3,280#. $39,500 in 1968/POP: c.250. U-4, -9 1962 = USAF and US Army respective redesignations of L-26. U-4B 1956 = POP: 14 redesignated from L-26B, plus 2 L-26C [55-4647/4648] ordered by and for President D D Eisenhower as the first lightplanes to earn the designation "Air Force One" and painted in the now standard blue-and-white color scheme. Aerocomp Inc, Merritt Island FL. Comp Air 3 19?? = Kit aircraft. 3pChwM. No data. Comp Air 4 19?? = Kit aircraft. 4pChwm; 150-180hp engines. No data. Comp Air 6 19?? = Kit aircraft. 6pChwM; 220-300hp; span: 35'0" length: 24'9" load: 1300# v:257/195/55. Comp Air 7 SL 19?? = Kit aircraft. 6pChwM; 657hp Walter 601D turboprop; span: 33'0" length: 30'6" load: 2000-2300# v: 237/225-250/50-60 range: 900. Comp Air 7 Turbine 19?? = Kit aircraft. 6-7pChwM; 657hp Walter 601D turboprop; span: 35'0" length: 29'6" load: 1670-2050# v: 257/250/55-65. Comp Air 8 19?? = Kit aircraft. 6-8pChwM; 657hp Walter 601D turboprop; span: 33'0" length: 31'0" load: 2000-2500 v: 229/225/55 range: 500-700. Comp Air 10 19?? = Kit aircraft. 10-11pChwM; 300hp Continental, later 724hp Walter LOM 601D. [N4105T]. Merlin 19?? = Kit aircraft. 2pChwM; 65-100hp engines. No data. Aero Gare, Mojave CA. 1987: Aero Composite Technology Inc, Somerset PA.
Sea Hawk 1982 = 2-3pCBAm; 70hp Revmaster. Sea Hawker 1982 = 2pCBAm; 150hp Lycoming O-320; span: 24'0" length: 21'6" load: 750# v: 148/138/42 range: 1200; ff: 7/x/82 [N82SO]. Marketed kits and plans. POP: 32 known flying by Mar 1988. Aero-Craft Mfg Co Inc, Detroit MI. Aero-Coupe 1928 = 3pO-CB; 120hp Warner Scarab; span: 32'0" length: 24'0" load: 1000# v: 115/100/38 range: 460. F R Anderson, a USAS Brig General at the time. Convertible to an open cockpit for training use, or the seats could be removed to make a cargo/mail bay. $5,800; POP: 1 , crashed in 1926. Selfridge Field Museum (MI) reportedly has info in their files, as well as two small photos. Aero Design Associates (pres: David Garber), Opa-Locka FL. DG-1 1977 = 1pCmwM rg; two 330 Mazda RX-3 tractor/pusher; span: 20'0" length: 20'6" load: 600# v (est): 450/350/98 range: 460; ff [N10E]: 7/25/77. Aero Designs Inc, San Antonio TX. Pulsar 1985 = 2pClwM; 64hp Rotax 532; span: 25'0" length: 19'6" load: 440# v: x/130/42 range: 400. Mark Brown. Based on Star Lite prototype [N500SS]. Marketed kits. Pulsar XP 1992 = 2pClwM; 80hp Rotax 912; load: 550# v: 165/140/x. [[N912XP]. Aero Dynamics Ltd, Div of North American Aero Dynamics (Canada), Arlington WA. Sparrow Hawk II, IIB 1986 = 2pCmwM, 64hp Rotax 532 (II) or 90hp Norton P62 (IIB) pusher; span: 34'5" length: 17'10" load 700# v (II/IIB): 105-130/95-120/36. Chuck Herbst. Twin-boom. [N8728A]. 1984 = Business aircraft, no data. Little, if any, production noted. 1946: Aero-Flight Aircraft Corp (pres: J K Nagamatsu), Buffalo NY. 1947: Long Beach CA. Streak 85 (AFA-1), 125 (AFA-2), 165 (AFA-3), 225 (?) 1947 = 2pClwM rg; 85hp Continental C-85-12FJ; span: 25'3" length: 21'2" load: 559# v: 175/165/52 range: 700 ceiling: 17,000'. James Nagamatsu (ex-Curtiss Co). All-metal; tricycle gear; tandem cockpits under a bubble canopy. $3,995; POP: 2 [NX92846]; logic suggests that 225 was a Continental and the model probably was AFA-4 [N6300C], but no data were found to substantiate this. Repowered at Long Beach in Oct 1947 with 125hp Continental C-125 as AFA-2 (length: 21'8" load: 600 v: 203/192/55 range: 600-750), and c.1949 as AFA-3 with 165hp Continental C-125 (length: 22'4" load: 635 v: 219/210/x range: 1065). Project abandoned after failing to arouse interest in a saturated post-war market. Disposition of prototype unknown. AeroLites Inc. (pres. Daniel J Rochè), Welsh LA. Bearcat 1984 = 1pOhwM; 42hp Rotax 447 or 52hp Rotax 503; span: 30'0" length: 17'6" load: 425# v:75/60/26 range: 120. Jack Hutchinson. Kits for home-builders. Agricultural version as Ag Bearcat with 63hp Rotax 532..
Aero Mirage Inc, Gainesville FL. TC-2 1983 = 2pClwM rg; 100hp Continental O-200-A; span: 21'0" length: 16'7" load: 425# v: 181/164/57-63; ff: 5/16/83. All-composite construction. [N2484V]. Aeromobile Safety Plane Syndicate, 215 Thayer Bldg, Norwich CT.
Safety Plane 1937 = 2pChwM; 120hp Ford. [NX17895]. Aeromod Inc (pres: E W Moore), N Little Rock AR. Loadstar Model 100 1966 = 2pCB; 105-180hp Lycoming; ff: 8/x/66. William G Dorsch. Conversion of Piper PA-18 Super Cub or J-3 Cub to biplane. Aeroplane & Automatic Balancing Machine Co.
API/Aeronautical Products Inc (fdr: Al Jackson), Detroit MI. A-1 1944 = 2pCH; 155hp Franklin(?). No data. [NX1270]. Flew in 1945, then vanished. A-3 1944 = 2pCH; 135hp Franklin; rotor: 30'0" v: 100/x/0. A refinement of A-1. POP: 1 [NX1272], no production. Aero Resources Inc, Gardena CA. J-2 1962 = Development of Jovanovich J-2. 2pCH; 200hp Lycoming O-360-A2D pusher; rotor: 26'0" span: 11'2" length: 16'0" load: 500# v: 122/95/0 range: 200 ceiling: 10,000'. D K Jovanovich. Stub wings supporting twin booms, twin tails. Three-blade rotor with articulated blades, unpowered in horizontal flight. Aeroscript Corp (Morris Kamar, Pincus Cashman, Minnie Israel), New York NY. 1961: Aero Spacelines, Inc (pres: A M "Tex" Johnson), Van Nuys CA. 1965: Aero Spacelines div of Unexcelled Inc (pres: V Read), Goleta CA -- designer Jack Conroy to Conroy Aircraft Corp. 1974: Became a division of Tracor. B-377GT aka Guppy-201 1970 = Four 4912hp Allison 501-D22C turboprops; span: 156'3" length: 143'10" payload: 54,000# v: x/288/x range: 500; ff: 8/24/40. Upper fuselage lobe with interior diameter of 25' added to stretched C-97 fuselage, plus parts from Airbus, Concorde, DC-10, and TriStar; engines from retired Lockheed Electras. POP: 4; 2 built by Aero Spacelines in early 1970s [N211AS/212AS] and sold to Airbus Industrie/Aérospatiale to haul components of A300Bs and Concordes, and 2 built in early 1980s for Airbus by UTA Industries in France. Retired by Airbus in early '90s; reportedly 3 went to European museums, and the last one was bought by NASA and is presently in use in the US. B-377MG Mini Guppy 1967 = Four 3500hp P&W R-4360-B6 Wasp Major or 4912hp Allison 501-D22C turboprops; span: 156'3" length: 132'10"; ff: 5/24/67. Stretched ex-USAF C-97 modified by addition of new upper fuselage lobe with interior radius of 18'; swing-tail for cargo loading. POP: 2 [N1037V, N111AS]; first aircraft powered by R-4360s, second by Allisons taken from Lockheed Electras; crashed at Edwards AFB on 5/12/70 after engine failure, crew of four perished. B-377PG Pregnant Guppy 1962 = Four 3500hp P&W R-4360 Wasp Major; span: 141'3" length: 127'0" v: 240; ff: 9/19/62. Jack Conroy. Ex-airline Boeing 377 modified by stretching the fuselage 16'8" and adding a huge, new upper fuselage lobe for outsize cargo. Capable of carrying 34,000# of cargo. Aircraft was loaded by removing the tail section just aft of the wing trailing edge. Used extensively in support of NASA space program. POP: 1 [N1024V]. B-377SG Super Guppy aka Guppy-201 1965 = Four 5700hp P&W T34-P-7WA turboprops; span: 156'3" length: 141'2"; ff: 8/31/65. Ex-USAF YC-97J modified by adding wing root plug, stretching fuselage 30'10", and adding huge new upper fuselage lobe with interior radius of 25'. Nose of fuselage pivoted to allow cargo loading. Used extensively in support of NASA space program, it was the only aircraft capable of carrying the third stage of the Saturn V launch vehicle and the Lunar Module adaptor. POP: 1 [N1038V]. Displayed at Pima County Air Museum, Tucson AZ. Guppy-101 1970 = Rebuilt from Boeing Stratocruiser with four 4900hp Allison 501-D22C turboprops; ff: 3/13/70. First with the opening nose section. Aero Sport Aviation Co, 723 Ventura St, Santa Paula CA. S-1 1934 = 1pOB; 37hp Continental. J S Marrott (unverified). No specs found for this mini-biplane. [X14202] c/n 2. Possibly related to the Sport/Andercraft built in 1932 by Fletcher & Sartain Co in Santa Paula, or could just be coincidental in time and place. Reg canceled by CAA on 12/1/34 when license expired. 1970: Aerosport Inc (fdr: Harris L Woods), Holly Springs NC. Rail 1970 = 1pOlwM; two Aerosport-Rockwell JLO LB-600/2 pushers; span: 23'4" length: 15'9" load: 272# v: 96/66/45 range: 120 ceiling: 12,000'; ff: 11/4/70 [N4334]. An essential design, hardly more than a winged rail, as its name suggests. T-tail, tri-gear; pilot out in the open in front. Quail 1971 = 1pChwM; VW 1500-1800cc; span: 24'0" length: 15'11" load: 258# v: 130/110/48 range: 230 ceiling: 12,000'; ff: 12/x/71 [N88760]. Scamp A 1973 = 1pOB; 60hp VW 1600-2100cc; span: 17'6" length: 16'8" load: 238# v: 95/90/42; ff: 8/27/73. R D Fehlner, E B Trent, Harris Woods. Tricycle gear, T-tail. Marketed plans and kits for home-builders. POP: reportedly 1,050 plan sets sold (no time reference). Woody Pusher c.1970 = 2pOhwM; 65-75hp Continental pusher; span: 29'0" length: 20'5" load: 520# v: 98/87/45. Marketed plans and kits for home-builders. Aerostar Aircraft Corp, Couer d'Alene ID, on acquisition of design and production rights to Aero Commander. 700, Super 700 19?? = 4-6pClwM rg; two 350hp Lycoming TI0-540-U2A (Super 700: modified I0-540-SIA5); span: 36'8" length: 34'10" load: 1715# v: 328/282/84 range: 1151 ceiling: 30,000'. FJ-100 1990 = Business jet. 6-8pCmwM rg; two 1200# Williams FJ33-1 turbofans; v: 460/x/x ceiling (max): 41,000'. Engines pylon-mounted on fuselage. 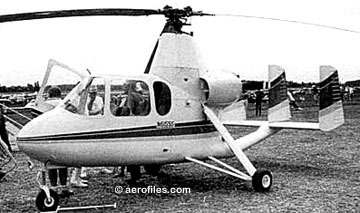 1970: Butler Aviation, Kerrville TX, acquisition of sales and manufacturing rights to Mooney. June 1971: Ended operations. SEE Mooney. Executive 1970 - Mooney M20F with 200hp Lycoming IO-360-A1A; span: 35'0" length: 24'11" load: 1100# v: 185/x/62 range: 1147 ceiling: 18,800'. $23,995; no production. Ranger 1970 - Mooney M20C with 180hp Lycoming O-360-A1D; span: 35'0" length: 24'2" load: 1050# v: 176/x/57 range: 1000 ceiling: 19,500'. $19,995; no production. Aero-Tech (pres: Alvin J Jarvis), Hastings FL. Boeing F4B-2/P-12C 1978 = 4/5-scale replica. 1pOB; 245hp Jacobs R-755-9; span: 24'0" length: 17'9" load: 570# v: 165/135/63 range: 386; ff: 8/x/78. Aerotek II, 1042 S Washington St, Afton WY. Call-Air B-1, -1A 19?? (A7WE, A8WE) = Certifications as Restricted category ag applicator with Lycoming IO-720-A1A (A7WE) and Normal category with P&W IR-985-AN1 (A8WE). Is a reacquisition from IMCO by the Call family? 1959: Aero Union Corporation (pres: Dale P Newton), Chico CA. Conversions of war-surplus aircraft with tank systems for firefighting operationAF-S2, B-17, C-119, C-130, CH-47, DC-3, DC-4, DC-6, DC-7, HU-16. 1941: Wally Timm Co Inc, Glendale CA. 1941: Aetna Aircraft Corp, Los Angeles CA. Aerocraft 2SA 1940 (ATC 733) = 2pOlwM; 160hp Kinner R-5; span: 34'6" length: 24'6" load: 614# v: 125/110/45 range: 400. Available with 175hp R-5. POP: 6. 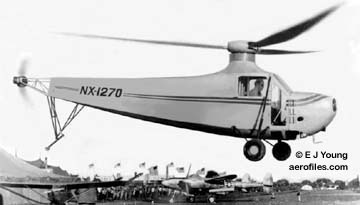 Tandem cockpits, but the prototype was modified from a side-by-side Kinner B-2 [NC14200]. Later versions known as Aetna 2SA. SEE Timm 160. Arthur & Peter Aggergaard, Viborg SD. A-1 1931 = 3pOM; 180hp Hisso E. Arthur Aggergaard. [587W] c/n 100; ff: 5/18/31. Built from parts supplied by Nicholas-Beazley Co at Marshall MO. Reg cancelled 2/1/33. A 1934 = 2pOMF; 40hp Ford A.  c/n 2.
c.1968: Ahrens Aircraft Corp, Oxnard CA. c.1977: Ahrens Aircraft Inc, Ramey, Puerto Rico (planned, but likely not implemented as financial backing failed). SEE Bromon. AH 404 1976 = 31pChwM rg; four 420hp GMC-Allison 250-B17B; span: 65'0" length: 48'4" load: 9400# v: 210/160/x range: 1380; ff: 12/1/76 (p: Herman "Fish" Salmon). POP: 2 [N404AR, N1028G]. Aeronautical Industries of Louisiana, Monroe LA. B-3-A 1934 = 1pOM; 41hp Church. [22Y] c/n 353. Express 1932 = 3pOM; Hisso. c/n 372. 18, 18A Heliplane 1996 (TC 1H17) = 2pC hybrid helicopter and autogyro; Lycoming O-320 pusher; v: 75/60/30. Triple tails. POP: 68 Umbaugh 18A produced through 1965, but doors closed in 1966. Extent of production after refinancing and restructing by Farrington unknown. Southern Aircraft Corp, Birmingham AL. 1928 = 2pOB; various 90-180hp motors; span: 32'5" length: 23'3" load: 850# v: 110/90/30 range: 700 (data for 90hp). Glenn Messer. POP: about 12; [715K] (Wright R-975), [876Y] (OXX-6), [883Y] (Siemens), [884Y] (Hisso E),  (OX-5), et al. 1929: Aircraft Inc (consortium of Wichita and St Paul businessmen), Wichita KS; aka Air Capital Mfg Co.
1929 = 2pOlwM; 60hp LeBlond 5D; span: 37'0" length: 23'6" load: 480# v(with 30hp motor): x/75/35. W C "Chet" Cummings. $2,750; POP: 1 reportedly built as a marketing test project. The title implies more of a funding organization than a factory, and is in all likelihood Watkins Skylark. 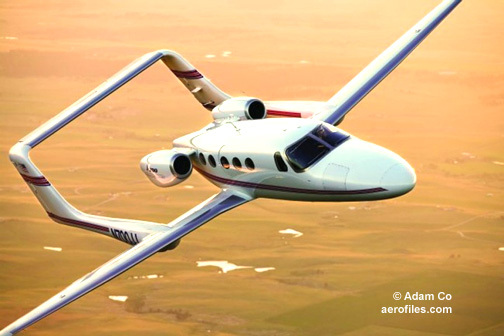 Aircraft Corp of America, New York NY; to be manufactured by Sikorsky Co for a consortium of NYC financiers and businessmen, including heads of May Co, Allied Chemical, and Gotham Hosiery. 1926 - Listed here only for interest value. Despite prominent advertising, there is no record of this consortium's aircraft being produced. Ads, along with attendant press releases about the Super Rhône-powered Airco Amphibian and Airco Super-Sport, soon faded from aviation publications. No connection with British Airco-de Havilland. Air Command Intl, Caddo Mills TX. 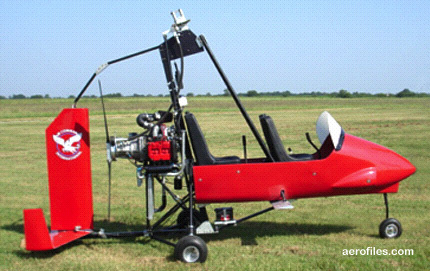 Commander Elite 2006 = Manufacturers of 1-2p gyroplane kits with 53-67hp engines, accessories, components. No data. AirCoupe Div, Air Products Co Ltd, Carlsbad NM (Took over Forney Industries in Aug 1960). 1963: Acquired by Alon inc (KS). F-1A c.1961 = Continuance of Forney Aircoupe F-1A. POP: c.30 by Forney and AirCoupe. SEE Alon. 1931: Air-Craft Corp of America, Portland IN, as a refinancing of Welch Aviation Co. 1936: Welch Aircraft Industries Inc, South Bend IN. Falcon 1932 = 2pChwM; 42hp two-cyl Air-Craft (Welch); span: 26'0" length: 20'6". $995, $1,150 with Continental A-40; POP: 1*. Orin Welch was undoubtedly the designer (and likely a principal), for the plane featured on a full-page Air-Craft Corp ad in Jan 1932 Popular Aviation bore the tail number of  c/n 107, which was the first of the later Welch OW-5M batch. * Possibly  c/n 108 was initially manufactured under this parent name, as well. Another interesting path leads to the Jackson B-2 (qv). Aircraft Associates Inc, Long Beach CA. J-2 Cub aka Western Cub 1936 (ATC 620) = 2pChwM; 40hp Continental A-40; span: 35'3" length: 22'5" load: 407# v: 87/80/35 range: 210. $1,270; POP: perhaps 10 to 20. Company, a principal distributor, began producing Taylor J-2 under a subcontract for Taylor Co after their disastrous Bradford PA plant fire in Mar 1937. Aircraft Builders Co (pres: John Dalchow Jr, Gen Mgr: Fred Butterworth), Coldwater MI. 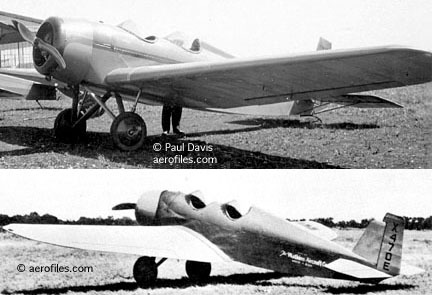 Parrot 1930 - 2pCM; Velie M-5 (?>Anzani). 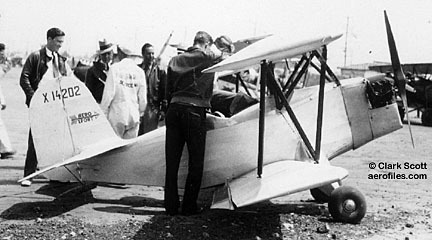 c/n 100; dismantled and reg cancelled 5/19/31. Aircraft Builders Club, Lakewood (Cleveland) OH. 1930 - 2pOB; Detroit Aircat. Byron Goodes Cook, mechanics class instructor at Independence High School in Cleveland, under whose guidance the plane was built by students. [NC10558] c/n 1. Cook was also involved with Sundorph Aeronautical. 1930: Aircraft Engineers Inc (fdr: Charles Laird), 1926 or 2012 S Wabash Ave (Greer College), Chicago IL. B-2 1930 = OB; Lambert R-266 engine; no other data found. POP: 1  c/n 2. Reg cancelled 11/21/32. ALSO SEE (Charles) Laird and Bryan-Laird. 1949: Aircraft Mfg Co, (possibly Ft Worth) TX. 1951: Ended operations. Texas Bullet 1949 - Production of Johnson Bullet. No data. BT-11 1940 - Plastic and plywood design to mock-up stage; none built. Aircraft Specialties Co, Saugus CA. Beta Bird 19?? = 1pOhwM; VW 1200-1600cc pusher; span: 25'6" load: 225#. Robert W Hovey. Marketed plans and kits. POP: ??. Wing Ding 19?? = 1pOB; 12-15hp pusher; span: 16'4" load: 188# v: x/45/26. Marketed plans and kits. POP: ??. 19?? (A33SO) = Civil conversion of Grumman HU-16A, -16B, -16C (UF-1, UF-1G), -16D (UF-2), -16E (UF-2G). OHS-111 1929 = 2pChwM; 55hp Velie M-5, also Warner Scarab. Very likely this is the Cabin-Aire monoplane that the company exhibited in Chicago in 1928. "OHS" designation was for company treasurer O H Snyder. [X7950]. Airgo Mfg Co (J Henley), Guthrie OK.
A-1 1926 = 3pOB; 90hp Curtiss OX-5; span: span: 30'0" length: 24'0". c/n 1 registered on 4/7/28 to "Holmes," then on 8/25/28 to "Moore," both of Hennessey OK. Reg expired 3/28/30. B 1929 = Unknown type; 90hp Curtiss OX-5. c/n 2 was registered on 1/26/29 to "Robinson & McKee" of Marshall MO, then on 6/14/30 to "Laier" of Kansas City MO. Air Investors as a holding group. United States Aircraft Corp, 76 Nelson St, New Brunswick NJ. SP-7 1929 = 2pOhwM; 100hp Kinner K-5; span: 28'3" length: 20'0" load: 550# v: 122/102/38 range: 600. Leo Mohme, based on his own 1928 aircraft (qv). 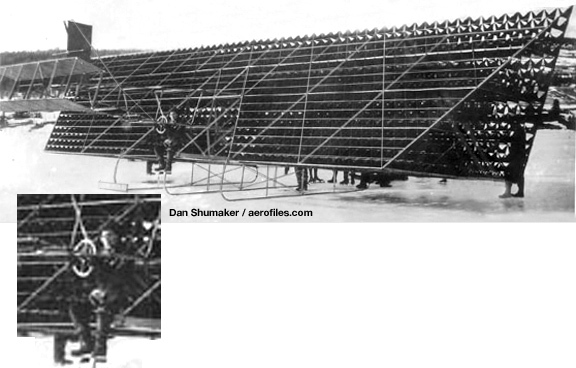 Plywood-covered parasol wing and forward fuselage. $3,945; POP: at least 7 [X217H (prototype), 291M, X336V, X402E, X870H (65hp Velie M-5), X10079, x]. SR-4 1929 = 1pOlwM; 110hp Warner Scarab; span: 24'0" v: 158/140/55 range: 500. Stretched Gee Bee look-alike with panted wheels. $9,500; POP: 1, built for Willard van Buren King to compete in the 1930 Miami All-American Air Meet [283V]. SR-5 1929 = 1pOlwM; 95hp Cirrus. Cirrus Derby entry [NR860W]. Air Leader Airplane Co, Floral Park NY. c.1926 = 3pOhwM; 90hp Curtiss OX-5. Surplus Curtiss JN-4D rebuilt as a parasol monoplane [X3742]. 1921: Airline Transportation Co (fdr: L E Hardy), Los Angeles CA. Arrow 1922 = 8pCB; 300hp Hall-Scott(? ); v: 100. 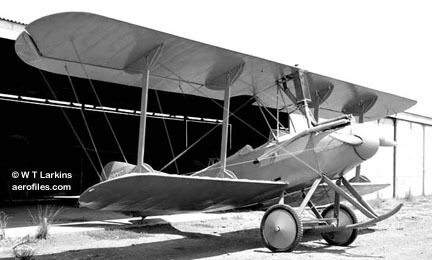 Transport, a major modification of a Standard J-1 by (John W) Rogers Aircraft Co, Los Angeles, for this aspiring LA-Imperial Valley airline proved unsatisfactory. It and the fledgling company flew into obscurity in the Depression Era; however, it left behind its mark as most likely being the second commercial airliner design, after Lawson Air-Liner. The above scan from Dennis Parks is of a picture in Feb 1923 Aero Digest, identified as "Rogers Aircraft Co Arrow," so we're going on a hunch that it belongs here, but it's not glued down permanently yet. Remnants of a J-1 are obscured in that extensive redesign, but those certainly look like the Standard's beefy wing struts. 1980: Airmaster Inc (pres: Lawrence Matanski), Renton WA. Avalon 680 1983 = 6-7pChwMAm; two 750hp PT6A-135 pusher turboprops; span: 39'0" length: 32'0" load: 1900# v: 250/200/65 range: 1448; ff: 10/x/83. Also planned Twin Star 1000 and military Guardian, none of which was produced as known. George Maves & Jimmie Watkins, Clover Field, Santa Monica CA. 1928 = 3pOM; 180hp Hisso E; v: 135/x/40. Built from plans supplied by Fokker Co in Germany. American Aircraft Corp, Chicago IL. Arrow B-7 1928 = 2pOB; 90hp Curtiss OX-5. $2,780; POP: 1 [NC813]. 1978: Air Tractor Inc (pres: Leland Snow), Olney TX. AT-301/301A/301B 1973, 1978-87 = 1pClwM; 600hp P&W R-1340; based on Snow S-2. AT-302/302A Turbo 1977 = 1pClwM; Lycoming LTP101-600A. AT-400/400A Turbo 19?? = 550-680shp P&W PT6. AT-401 1986 = 600hp P&W R-1340. AT-402 Turbo 1988 = 680shp P&W PT6; ff: 8/x/88. AT-501 1984 = 600hp P&W R-1340. AT-502 Turbo 1987 = 680shp P&W PT6; ff: 4/x/87; [N4531K]. AT-502A 1992 = 1100shp P&W PT6-45R; ff: 2/x/92. AT-503 1986 = 2pClwM; 1100shp P&W PT6-45R; ff: 4/25/86. POP: 1. AT-503A 1990 = 2pClwM; 750shp PT6A-34; [N503CP]. AT-802 1990 = 2pClwM; 1100shp P&W PT6-45R; ff: 10/30/90 [N802LS]. AT-802A 1992 = 1pClwM; ff: 7/6/92 [N1546H]. AirUtility Cargo Co, North Sacramento CA. AU-18 1949 = 1pOmwM; two 75hp Continental C-75; span: 39'11" length: 21'11" load: 797# v: 125/x/x; ff: 4/18/49. Elsworth Gardenhire. Twin-boom, twin-tail fuselages with pilot's pod atop the wing midsection; detachable lower portion as a cargo pod. POP: 1 [N68819]; retired after its final flight in 1958. 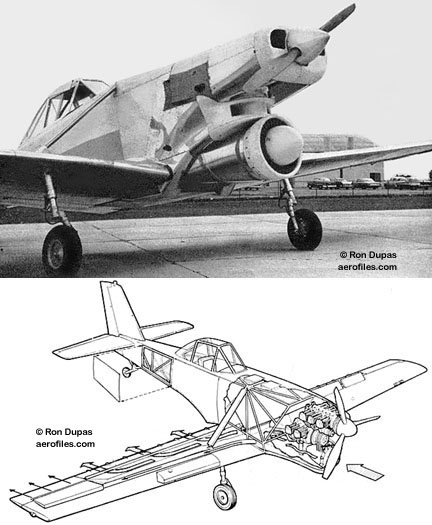 Modifications led to 1954 designation as AU-18-150B, as well as experimental AU-27 with 130hp Lycoming O-290, a ground-support plane for military trials (span: 48'6" length: 28'3"). Airwings Inc, New Brunswick, NJ. Airwings X 1934 = 2pOM; 90hp LeBlond. .
Airworthy Airplane Co (George Antolchick & Frederick H Jolly), Chicago IL. Terrier 1928 = 3pCM; three motorcycle engines. "Semi-bat wing." POP: 1 [X88E] c/n 1-T. Letter from Jolly to CAA 11/15/28 cancelled the license "since the plane never has been finished." 1951: American Jet Industries Inc (pres: Allen E Paulson), Van Nuys CA; conversions of cargo aircraft. 1978: Acquired Gulfstream from Grumman-American as Gulfstream American Corp (qv). Hustler 500 1978 = ff: 1/11/78. Became Gulfstream American Hustler. T-610 1968 = Temco TT-1 modified with 2950# GE CJ610-6 turbojet. POP: 1 [N7754A]. Turbo Star 1961 = Conversions of Cessna 402 and 411 to 400hp Allison 250-B17 turboprops. John D Akerman, Minneapolis MN; Northland Aviation Co.
JDA-8 1931 = 2pOhwM; 45hp Szekely pusher; v: 45/x/x. Side-by-side cockpit; braced, single-boom empennage, tricycle gear. POP: 1 [X897K]. Akerman, professor of aero engineering at Univ of Minnesota, was also partly responsible for the designs of some Mohawk aircraft. Tailless 1936 = 1pOM. Built as a student project, the flying-wing design with elevons and wing-tip rudders made only one flight [X14880]. A-1 c.1930 = No data; Hisso A. [373V] c/n A-1. Earl T Akin, Breckenridge TX. Stinger c.1990 = 1pCmwM; 100hp Continental O-200; span: 17'5" length: 16'0". Based on T-tail Cassutt. Fabric-covered steel-tube fuselage, plywood-covered wooden wing. [N7XR].